Polapit Tamar | Launceston Then! 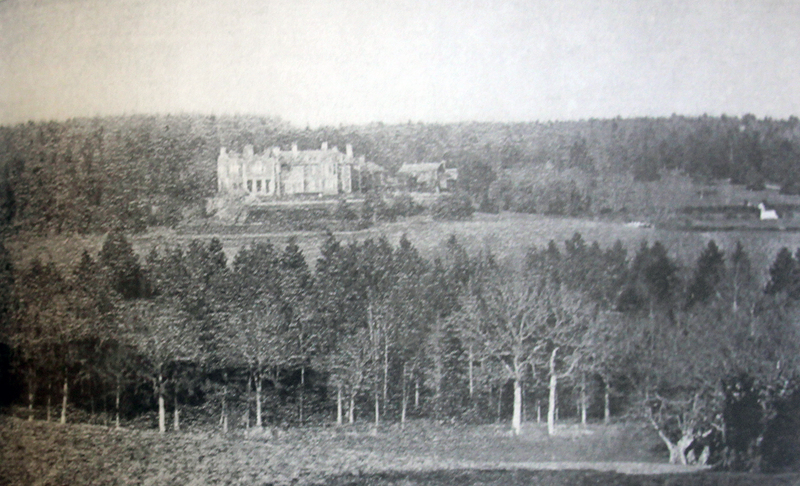 Wilkie Down was for many years the manor-house of the Coode family until the mid nineteenth century when a new mansion was built a thousand yards eastward at Polapit Tamar by Edward Coode. Wilkie Down is now a large farm of about 400 acres, but with its many spacious rooms, prestigious frontage, and wide views extending to Dartmoor, it still retains its manorial atmosphere and dignity. Edward was born in 1821 at St. Austell and was to play an important role in Cornwall’s governance and amongst other roles he served as the chairman for the County Police committee. He was also a a county magistrate at both Launceston and Lifton, being made a justice of the peace for Lifton in 1867 (he was also a J.P. For St. Austell). He also filled for many years the positions of chairman of the Association Committee of the Launceston Union, chairman of the Governors of the Horwell endowed school, and President of the Launceston Infirmary and Rowes dispensonary. Polapit Tamar in the 1940’s. 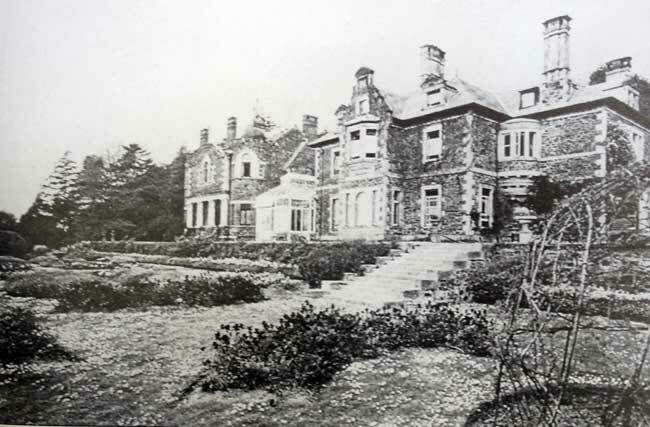 Edward built Polapit Tamar in 1866 and this was extended in 1901-3 by Robert P. Whellock for Edwards son, Captain Richard Carlyon Coode (1856-1931) who inherited the estate on the death of his father in January 1894. The house has a complicated plan with service rooms to rear right facing yard and reception rooms on garden front. The early twentieth century extension on the left comprises a ballroom with chambers above.The exterior has a garden front partly remodelled in the early twentieth with the extension on left. The earlier range to right has a symmetrical 3-window front, the central bay set forward with a Flemish gabled end. Round arched opening on ground floor with oriel window above. Flanked by nineteenth century sashes with margin glazing bars on ground and first floor. Set back on right is a lower range with a 5-window front; canted bay window to left of centre with shallow projecting bay to right. 12-pane sashes on ground and first floor with glazed verandah across front. Set back to left is a late nineteenth century conservatory. To the left, the extension designed by Whellock has a symmetrical 3-window front, the centre advanced with wide segmental pediment and a modillion cornice; central entrance. The entrance loggia to front has paired Ionic columns and above in centre and to right and left are Venetian-style windows and battlemented parapets to the canted side walls. The attic rooms are roofed with 2 round cupolas flanking a taller square cupola, all with very tall finials with ball tops which produce an unusual skyline.The rear elevation to the yard has a 2-storey canted entrance. The round-headed door arch with the arms of the Coode family above. The curved wall of the stair tower in angle to left. Interior: The ballroom is panelled in oak and has ornately carved chimney-pieces,the over-mantle of one of the chimney-pieces carved with a view of Launceston. Richard Coode married Joan Sylvia Gott, daughter of the Rt Rev. John Gott (Bishop of Truro) and Harriet Mary Maitland, and their son was Major Perceval Edward Gott Coode (1910-1944). Perceval married Ida Cicely Venetia Maitland but was killed in action on June 28th 1944 whilst serving with the 5th Battalion of the Duke of Cornwall’s Light Infantry and is buried at BAYEUX WAR CEMETERY, Calavdos, France. 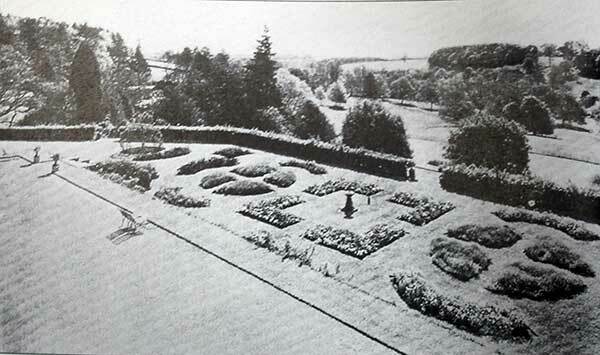 Polapit Tamar gardens in 1941. By this date however, the house and estate had passed out of the family having been sold in 1931 to Mr. W. R. Dingle who originated from Launceston, but for over forty years had been running a successful business at Woolwich, London. With the help of Mr. J. L. Dingle, a hotelier from Bristol but who’s father also came from Launceston, the house was converted into an hotel providing accommodation for up to 50 guests. This proved to be a short term and for a while it was used as a school. 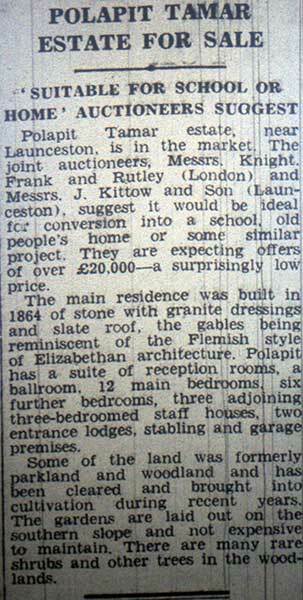 The estate came up for sale again in 1968 and was eventually bought by Mr. Tucker a local farmer who converted the house into flats. 1968 Polapit Tamar Estate sale.